Read our newest post for Best Social Campaigns in 2017! This is a guest post from Michael Patterson, Digital Marketing Specialist at Sprout Social. Although hashtags were created as a way to organize the massive amount of content working its way through Twitter, they’ve since evolved into something much more. Hashtags have become a way for people and brands to create conversations, to interact with friends and fans, and to promote their products to massive amounts of new users. There are two main ways brands can take advantage of hashtags for their marketing efforts: creating their own hashtags and taking advantage of trending hashtags. Each has their own benefits, shortfalls and fantastic examples that we’ll explore. Creating a new hashtag is difficult but, if it catches on, the brand behind it benefits from the lion’s share of credit and awareness. Another main reason you’d want to create your own hashtag is so you can guide the conversation, and in so doing, control the kind of content fans submit using your hashtag. For example, if you look up Purina’s campaign #PetsAtWork you’ll see just that: people posting pictures of their pets in their offices. However, it’s not as easy as inserting a hashtag before any old phrase and reaping the rewards. These days there are so many horror stories out there of brands who have had the hashtags that they’ve created used against them to smear their brand. Try to avoid a social media explosion by creating a tag completely free of ambiguity, which allows you to effectively steer the conversation in a direction favorable for your brand. This year Red Bull came away with the prestigious “Best Use of A Hashtag” Shorty Award with its #PutACanOnIt campaign. Though the hashtag was created by Red Bull, it was inspired by a photo the company found on Twitter wherein the photographer is seen holding a Red Bull can above a Mini Cooper to make it look as though it was a trademarked Red Bull car. The trend exploded as people around the world began creating their own images with Red Bull cans placed in unique positions. Coca Cola has had some seriously amazing marketing initiatives over the years. One of the best examples is the unique way the brand rigged its vending machines to interact with customers. Coca Cola was able to successfully turn this into a hashtag campaign by encouraging drinkers to Tweet their own stories with the hashtag #ShareACoke. This campaign hasn’t just garnered hundreds of thousands of Tweets, but it has also given Coke the opportunity to create new sub-campaigns. For example, submitting a bottle or can with the name “Ryan” on it could win you a chance to #ShareACoke with Ryan Seacrest. We’ll likely see quite a bit more of the #ShareaCoke campaign over the next couple of years, as Coca-Cola continues production of the unique bottles and cans. Though some of the more bashful fans may not have found it entertaining, Charmin’s #TweetFromTheSeat campaign found wild success on Twitter, and the company has been steadily increasing its Twitter following since. However, the squeamish should read at their own risk—some of the posts get a little strange. This was an amazing example of using something topical to create a relevant campaign, and Oreo saw tons of engagement on its posts. Using a well known hashtag—or attempting to hijack a trending hashtag—is a dangerous move, but one that can really pay off if it works out for you. The key for riding the success of a trending hashtag is to make sure that it isn’t a controversial trend, and that it’s relevant to your brand. 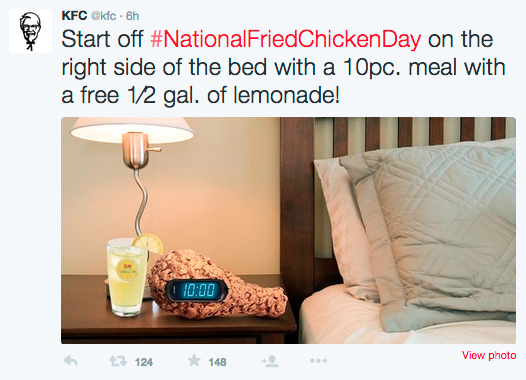 Unfortunately, sometimes brands miscalculate the proper time to use a different trend. For example, pizza company Digiorno decided to use the then trending hashtag “WhyIStayed” in a Tweet to promote its product. What Digiorno probably didn’t realize was that this hashtag pertained to domestic abuse, and the company faced a social uproar for using it. Audi’s #WantAnR8 campaign is still looked at as one of the single most successful Twitter campaigns in history. It all started when the car company saw that somebody had sent out a Tweet with the hashtag #WantAnR8 to explain why they wanted an Audi R8. Audi quickly created a contest that bolstered the use of this hashtag. All users had to do was create and post a Tweet using that hashtag and they’re entered for a chance to win an R8 for a day. For a while this was the most engaged hashtag of all time, and Twitter called it the most successful campaign ever at the Cannes Lions 2012. Sometimes a trending hashtag just works out perfectly for a brand. One such time was when #NationalFriedChickenDay started trending and Kentucky Fried Chicken took complete advantage of it. This is such an amazing opportunity because KFC isn’t just getting its name in front of a ton of people, it’s getting it in front of a ton of qualified, hungry customers. A lot of times you’ll see phrases like this trending on Twitter, asking users to summarize a certain activity or event in a few words. Denny’s Diner, a company already very well known for its funny Twitter presence, took advantage of one such trend all about explaining #collegein5words. This is a perfect example of taking a trend and making it relevant for your brand. It lead to a great amount of engagement for Denny’s. Hashtags can can lead to fantastic engagement on social media, but they can also require quite a bit of effort to maintain. Here are a few tools that can help you effectively manage your hashtag campaigns. TINT lets you connect and display any social media feeds and hashtags. Easily create a new display that shows off your individual hashtag campaigns to use at events, in stores or even just at the office. You can get a free trial here. When you’re thinking of hashtags that you could use to engage with your audience, it’s also beneficial to look toward your audience. Find the keywords and hashtags that are already associated with your brand, and bolster the positive ones. With something like Sprout Social’s Trends report, it’s easy to find out exactly which terms are being associated with your brand most often. Though hashtags have been somewhat stigmatized in popular culture, they really do play a crucial role on social media when used correctly. Hashtags give users the incentive to categorize their own social posts, making it easier for other users to find content relevant to what they’re interested in. Hashtags are also an easy way to distribute popular news to groups of social users who may not have been actively searching for it, which is why hashtags are here to stay. Also, if you have any hashtag campaigns you want to launch and need help boosting engagement, feel free to reach out and we’d love to strategize with you! Read our newest post for Best Hashtag Campaigns in 2018! Bonus: Download a free checklist that will show you how to craft the perfect hashtag. Each has their own benefits, shortfalls and fantastic examples that we’ll explore. Why do blogs like these cover only brands which already have a huge outreach or are already a brand? It is much easier for them to reach their audience and make a hashtag popular. Would really appreciate if you give such use cases of startups or lesser known companies who have gained popularity with their hashtag campaigns. We have it in India too ! I guess companies like Coke reads blogs from obscure websites.